Every four years… this World Cup takes place between the 14th June & 15th July. 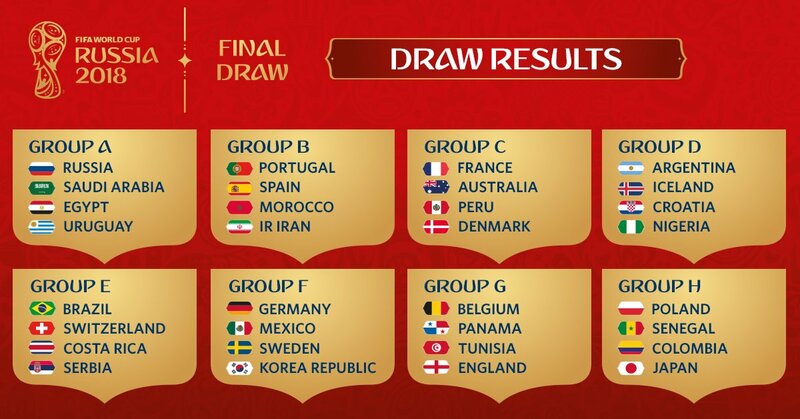 The 32 countries that qualified for the 2018 World Cup have been drawn into 8 groups of 4 teams. Morocco 0 - 1 Iran : https://www.youtube.com/watch?v=rG6hK0eZ_Ys - "
Portugal 3 - 3 Spain : https://www.youtube.com/watch?v=4rp2aLQl7vg - "
France 2 - 1 Australia : https://www.youtube.com/watch?v=-4_SXeQdIJo - "
Argentina 1 - 1 Iceland : https://www.youtube.com/watch?v=Xvarnwv6hRk - "
Denmark 1 - 0 Peru : https://www.youtube.com/watch?v=O4odLCih0Os - "
Croatia 2 - 0 Nigeria : https://www.youtube.com/watch?v=qS-V5h0wKr8 - "
Costa Rica 0 - 1 Serbia : https://www.youtube.com/watch?v=bA6_7wFvG0E - "
Germany 0 - 1 Mexico : https://www.youtube.com/watch?v=6BSeFs40QOI - "
Brazil 1 - 1 Switzerland : https://www.youtube.com/watch?v=3dWrKNrWbWQ - "
Sweden 1 - 0 South Korea : https://www.youtube.com/watch?v=5ZlE-hUl5UU - "
Belgium 3 - 0 Panama : https://www.youtube.com/watch?v=XCr1xpwEuZQ - "
Tunisia 1 - 2 England : https://www.youtube.com/watch?v=u3wfrhjoIJg - "
Colombia 1 - 2 Japan : https://www.youtube.com/watch?v=y4SeAfCg7-o - "
Poland 1 - 2 Senegal : https://www.youtube.com/watch?v=SXkg_12ukOk - "
Russia 3 - 1 Egypt : https://www.youtube.com/watch?v=AygUlfmQgBs - "
Portugal 1 - 0 Morocco : https://www.youtube.com/watch?v=sEtVNlzYAqQ - "
Uruguay 1 - 0 Saudi Arabia : https://www.youtube.com/watch?v=ZxEMQTAGYzI - "
Iran 0 - 1 Spain : https://www.youtube.com/watch?v=_3C6DK8n0mQ - "
Denmark 1 - 1 Australia : https://www.youtube.com/watch?v=24m_D5EFb-A - "
France 1 - 0 Peru : https://www.youtube.com/watch?v=9-QIE-xaueo - "
Argentina 0 - 3 Croatia : https://www.youtube.com/watch?v=hcM5n71XmBo - "
Brazil 2 - 0 Costa Rica : https://www.youtube.com/watch?v=u2v_mb5Xx00 - "
Nigeria 2 - 0 Iceland : https://www.youtube.com/watch?v=KIk9avLQSds - "
Serbia 1 - 2 Switzerland : https://www.youtube.com/watch?v=0O3CbugZtTg - "
Belgium 5 - 2 Tunisia : https://www.youtube.com/watch?v=RKuQ8zDo0Lw - "
South Korea 1 - 2 Mexico : https://www.youtube.com/watch?v=UOSg165xRTw - "
Germany 2 - 1 Sweden : https://www.youtube.com/watch?v=4e9a3KptfC0 - "
England 6 - 1 Panama : https://www.youtube.com/watch?v=d1gw5sc2JlY - "
Japan 2 - 2 Senegal : https://www.youtube.com/watch?v=TLS1JQ7qtpI - "
Poland 0 - 3 Colombia : https://www.youtube.com/watch?v=wa974tOozEI - "
Saudi Arabia 2 - 1 Egypt : https://www.youtube.com/watch?v=lEzuFPeSBcA - "
Uruguay 3 - 0 Russia : https://www.youtube.com/watch?v=I_YrTEiOVGo - "
Iran 1 - 1 Portugal : https://www.youtube.com/watch?v=JlPIrEKFCeo - "
Spain 2 - 2 Morocco : https://www.youtube.com/watch?v=cIOqidBVnO4 - "
Denmark 0 - 0 France : https://www.youtube.com/watch?v=UvFP1ITZ7To - "
Australia 0 - 2 Peru : https://www.youtube.com/watch?v=fR-txBJG-B4 - "
Nigeria 1 - 2 Argentina : https://www.youtube.com/watch?v=RmlkAOwJ1gI - "
Croatia 2 - 1 Iceland : https://www.youtube.com/watch?v=wfy1ojdPyzA - "
South Korea 2 - 0 Germany : https://www.youtube.com/watch?v=OKjV2SQfKrw - "
Mexico 0 - 3 Sweden : https://www.youtube.com/watch?v=BHT6V1SpmNA - "
Serbia 0 - 2 Brazil : https://www.youtube.com/watch?v=_dusyi-4pMs - "
Switzerland 2 - 2 Costa Rica : https://www.youtube.com/watch?v=izvscMabH8o - "
Japan 1 - 0 Poland : https://www.youtube.com/watch?v=K7pVlD8Q660 - "
Colombia 1 - 0 Senegal : https://www.youtube.com/watch?v=2CRmHuN-O84 - "
Panama 1 - 2 Tunisia : https://www.youtube.com/watch?v=nc9zirKrT0Q - "
England 0 - 1 Belgium : https://www.youtube.com/watch?v=N5F1hqWW_5w - "
Uruguay 2 - 1 Portugal : https://www.youtube.com/watch?v=auqyXFLZ_zw - "
Spain 1 - 1 aet Russia (Russia win 4-3 on pens) : https://www.youtube.com/watch?v=gHPke43iqNg - "
Croatia 1 - 1 aet Denmark (Croatia win 3-2 on pens) : https://www.youtube.com/watch?v=5_iIW2DZ8nc - "
Brazil 2 - 0 Mexico : https://www.youtube.com/watch?v=kYIf8I1dvdo - "
Belgium 3 - 2 Japan : https://www.youtube.com/watch?v=fJeJuc27ggE - "
Sweden 1 - 0 Switzerland : https://www.youtube.com/watch?v=012FkPcI1uE - "
Colombia 1 - 1 aet England (England win 4-3 on pens) : https://www.youtube.com/watch?v=RbmaLT320hw - "
France 2 - 0 Uruguay : https://www.youtube.com/watch?v=_YK4o-Gbppg - "
Brazil 1 - 2 Belgium : https://www.youtube.com/watch?v=t8IK0ZqfxNI - "
Sweden 0 - 2 England : https://www.youtube.com/watch?v=Wr7-HtVlAdI - "
Russia 2 - 2 aet Croatia (Croatia win 4-3 on pens) : https://www.youtube.com/watch?v=wjU8j2bj3RY - "
France 1 - 0 Belgium : https://www.youtube.com/watch?v=ntQsMSuEbyg - "
England 1 - 2 Croatia (after extra-time) : https://www.youtube.com/watch?v=gi_2GELMwfY - "
Belgium 2 - 0 England : https://www.youtube.com/watch?v=x_5SJPKMHAA - "
France win the 2018 World Cup. In Dec '17: Ger 5/1, Bra 5/1, Fra 6/1, Spa 8-1, Arg 9-1, Bel 12-1, Eng 16-1, Por 28-1, Rus 40-1, Cro 40-1, Col 40/1, Uru 40-1, Den 100-1, Swi 100-1, Swe 100-1, Mex 125-1, Ser 200-1, Ice 500-1, Aus 750-1, Pan 2000-1, Sau A. 5000-1. I’ll be likely routing for Iceland - fantastic achievements in footy of late, and superb rapport / togetherness with their supporters too. They are also the smallest nation to ever make it to a World Cup Finals. You? Football? They’re finally going to hold a world tournament for football? Does every footsocc thread have to involve a conversation about what to call it? So were other things that we have moved on from because they sucked too. I didn’t know this one sucked, I just thought it was funny. Hey, who decides what is and isn’t legitimate? As usual, I miss the joke. I decide what is legitimate, per your decree, and I have decided the football/soccer joke is not. I’m not very confident for many reasons (Spain back in business, Brazil getting better), so… we shall see when it begins ! and May the FIFA be with you. Always. ^ I saw a bit of France vs Ireland (towards the end - when it was really lashing down with rain! 😃) - the depth of the French squad looks superb, and easily brushed aside Ireland who only really offered the occasional counter-attack and set-pieces -though a good warm-up vs a defencive minded side. Am off to se Brazil vs Croatia this Sunday in a pre-World Cup match - may be worth putting a couple of £ on Croatia to do well in Russia - and they plays some decent attractive footy with some quality players. Brazil & Germany both at 9/2, Spain & France at 6/1, Argentina 10/1, Belgium 12/1, England 16/1 (likely because of the amount of bets the English put on them rather than odds of actually winning it), Portugal 28/1, Croatia 33/1, Uruguay & Colombia at 33/1, Russia at 40/1, Poland 80/1, Denmark 100/1, Egypt, Senegal & Serbia at 250/1, Iceland 400/1, Australia at 750/1, with Saudi Arabia at 2000/1. apparenty the fifa 18 simulation’s result was a french win. and they got the last two right, so… better watch out for france! i’ll be rooting for my home country of brazil, naturally. too bad dani alves got injured a couple of weeks ago - we literally have no one else to put in his place. i’ll also be rooting for england. we’ll see how that goes. I kinda think Spain didn’t have a choice - what were Madrid and the manager thinking? Timing of statement was stupid! Good point - seems there may have been a leak or possibly some politics involved. Real Madrid, eh? Hierro as manager too… experienced and respected as a player, serving his time and earning his dues coming up as a coach - though that’s a big ask, and in far from ideal circumstances! I’d imagine compensation may have been in the thinking, it’s all bizarre. Madrid will have a PR disaster if Spain crash out. Just read about Heirro - probably best that they can hope for in these circumstances. BBC have his solo goal up on their website from 94 on the article - any excuse to see that again is worthwhile. Wasn’t expecting that scoreline from the Russians - fair play to them, 5-0! Thought that was harsh on Saudi’s - yet for all the neat technical play and quick feet in the middle of the park they did struggle in both final thirds.